Roof Stability - Is the roof strong enough to support the weight of a human. Are the trusses intact? Will the roof bow on a hot day? Check the underlayment before going onto the roof. Ladder Security & Placement - Is the ladder secure and at a 4:1 angle, are the feet secure, the top above the roofline and tied securely. A number of fatalities occur each year because of a poorly placed ladder. Weather Conditions - Ice, snow, and wind are always a hazard on a roof if the shingles or other surfaces are slippery. Membrane roofs are especially slippery in wet conditions and should be avoided under these circumstances. 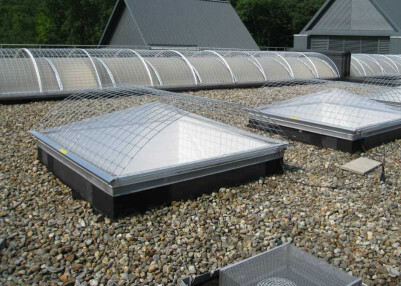 Roof Holes - Unguarded skylights and poorly covered holes. 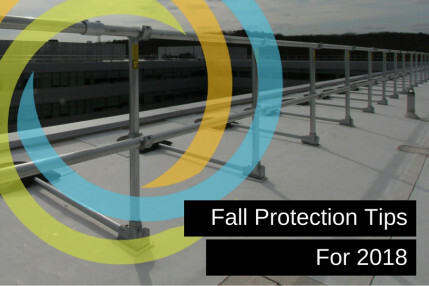 Without fall protection, an open hole on a roof can be just as deadly as the roof edge. Edge Awareness - Losing the edge of the roof can be a problem when you are engaged in roof work. Some employees get so wrapped up in their project that they forget where the roof edge is. Improper Training - If there is someone on the roof who has not been properly trained, they are a rooftop safety hazard and could cause serious injury to themselves or others. Improper Use of Fall Protection Equipment - Such as: poorly anchored railing, lanyard too long, or weak tie-off point. Poor Line of Sight - Ridge vents, chimneys, shingle bundles may block egress on a roof. Pitch - The steeper the roof is, the easier the fall. Ensure that the fall protection and shingle bundles are secure before setting foot on the roof. Split Level Roofs & Fall Heights - Employees engaged in roofing activities on low-slope and split-level roofs with unprotected sides and edges 6 feet (1.8 meters) or more above lower levels should have the proper fall protection equipment. 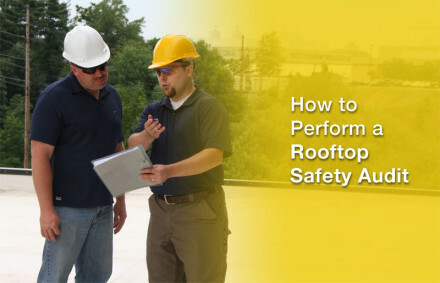 Rooftop safety is the responsibility of every person involved in the project. The hazards are always there, but identifying them and adhering to the use of fall protection can avoid a lot of injuries and deaths. When wearing a harness, make sure the lanyard is the right length. If the lanyard is six feet long fully stretched and your shoulder height is five feet, the fall needs to be more than twelve feet for the fall protection to work. Make sure that railing and skylight guards are in place. A lot of accidents occur when there is not a clear line of sight to the hazard and you could fall through the hole. This accident occurs most frequently when snow covers the skylight and goes unnoticed. One of the deadliest hazards on a roofing project is a poorly placed ladder. Either the angle is wrong (1 foot away from the wall for every four feet of ladder height) or the top of the ladder is not securely pinned to the roof. OSHA has several reports of people climbing a ladder with a bundle on their shoulder and the center of gravity change caused the ladder to fall. The worker falls backward and the bundle is the cause of the injury, not the ladder swing. Ensure that the feet are firmly planted on the ground and the ladder is square to the wall it is facing. Regardless of the situation, fall protection should always be used and a working knowledge of the PPE (personal protective equipment) will save lives. 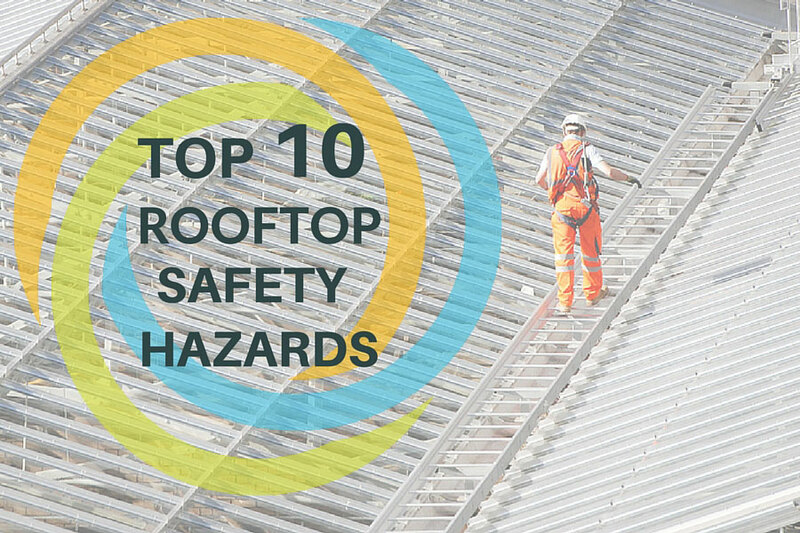 The top ten list was comprised from fatalities in the workplace with detailed reports on the OSHA website.